ACM just announced that Tim Roughgarden has won the 2009 Grace Murray Hopper award (“awarded to the outstanding young computer professional of the year”) for “his research combining computer science and game theory to analyze network routing among self-interested parties“. Congratulations to Tim as well as to the winners of the other ACM awards. 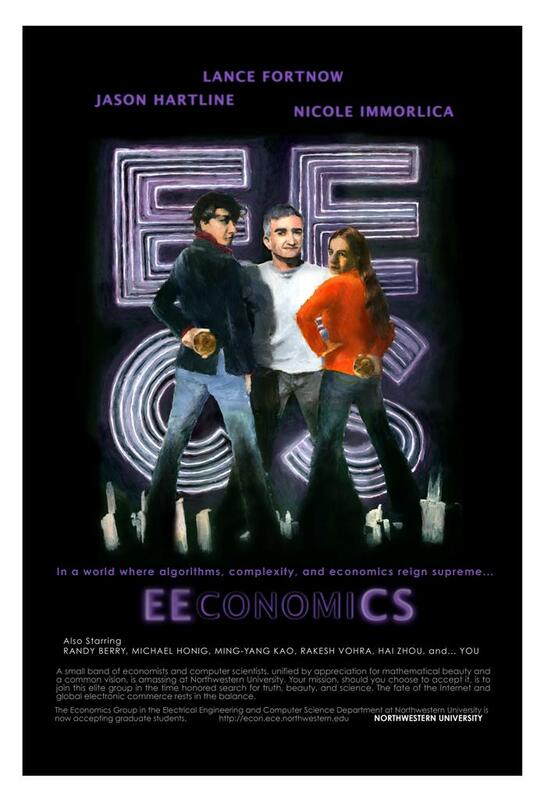 CS ∩ Econ = Algorithmic Economics? David Pennock returns to the question of how to call the field the lies at the intersection (or maybe crossroads) of economics and computation. As I described in my first blog post, about a year ago, many of us were loosely using the term “algorithmic game theory” for this field as well, but I have to agree that this puts a wrong spin on the field. Economics does go beyond game theory and “CS ∩ Econ” goes beyond “CS ∩ GT”, and so should the name, if only to covey this message. This would also fit more naturally various areas that are often considered part of “AGT” but are really not GT: from computation of market equilibria, to prediction markets, to social networks, and much more. So let me second David’s suggestion of Algorithmic Economics which also combines nicely with Algorithmic Game Theory yielding Algorithmic Game Theory and Economics. This sounds better than the wider “computation and economics”, while the perhaps more precise “computational economics” is sort of taken (although we could think of a hostile take-over, I suppose). Maybe I should change the name of my blog to Algorithmic Game Theory and Economics? Accepted papers will be collected in informal workshop notes, printed copies of which will be available at the workshop. To accomodate the publishing needs of different scientific communities, we stress that authors will retain the copyright of their papers and that submitting to COMSOC-2010 does not preclude publication of the same material in a journal or in archival conference proceedings. Submissions of papers describing original or recently published work on all aspects of computational social choice are invited….. All submitted papers will be reviewed by the program committee. I wonder what does this really mean. The issue of copyright is pretty clear but seems scientifically irrelevant, especially since one would hope that most papers will be available freely on the web (preferably on arXiv and findable from the COMSOC website). The fact that written proceedings will not be made available using “normal” print venues also seems clear but, again, who cares? Many “archival conferences” don’t have printed proceedings either, mostly since these seem pretty useless given the web. To accommodate the publishing traditions of different fields, authors may instead submit working papers that are under review or nearly ready for journal review. These submissions will be subject to review and considered for presentation at the conference but only a one page abstract will appear in the proceedings with a URL that points to the full paper and that will be reliable for at least two years. One may ask whether a paper is “really” published if it appeared in a non-archival conference. My point is that the meaning of “really” is not very real. There is the question of to what extent was the paper evaluated and refereed, but this does not seem related to the “archival” nature of the conference. As an example, EC papers are judges in the same way whether or not they choose the non-archival track; I also doubt that the “non-archival” status of COMSOC will have much bearing on how the PC evaluates papers. There is the question of whether one writes it on their CV — but different people may do different things, and even the same person has different versions of their CV according to the standards of those that request it. Finally, there is the all important question how much weight and prestige is attached to the conference publication, in hiring, promotion, or grant decisions (as is uniquely done in CS). This again widely differs between institutions, as well as the issue in question. For example, from my limited experience, more weight is given to conference publications in hiring decisions than in tenure decisions, and more weight is give to conference publications by top ranked departments than by lower ranked ones. Is this prestige a function of the “archival” status of the conference? I doubt it. The bottom line is that at first approximation any conference will gain or lose prestige according to whether appearing in it is indeed an indication of scientific quality. In the case of COMSOC, as for any other young conference, this still remains to be seen. The list of accepted papers for EC 2010 has been posted.